AS expected the rise of general Vladimir Padrino as co-president of Maduro has changed nothing. After all Venezuela has been a dictatorship for a while, of a new XXI century kind certainly, but a dictatorship nevertheless. It was all just a formality. Padrino cannot succeed in his attempt at putting food on the table of Venezuelans. His multiple inspections, in combat drag, of food producers have revealed no scandal so far, no hoarding, no lack of manufacturing will. The reason why there is no food production in Venezuela is simple, it is because there is nothing to make food out of. For better or for worse, and with chavista bred officers it is likely for worse, Padrino seems to have been put there to prepare, or chair, a transition out of Maduro's mess. We already have the first signs on how doomed this might be as clashes between radicals and pragmatists, military and civilians have come to the forefront this past week. One, for example, has been setting up a system for forced labor. I kid you not. A decree states that the regime can draft workers from private agribusiness to work for up to 60 days (and 60 more if needed) in the state agricultural undertakings. That is right, I repeat, workers from agribusiness, even myself, could be forced to go to work where the regime decides. I am not insulting the intelligence of readers discussing the historical precedents that say that forced labor never ended up in something positive, and always brought different levels of tragedy. No, the details are more interesting in a decree that cannot be applied. First, there is no provision as to what would happen to a worker refusing to go to a state run facility (employers MUST part with the employees drafted while preserving their social benefits and their penalty does not need to be expressed since we know by experience what the regime does to us). Second, those business that still produce something could well come to a stop if they lose their trained personnel. Where would be the food relief in the country?. One chavista union official quickly went to say that no one would be forced to serve against their will. But that is quite hollow when you read the decree where only different forms of expressing obligations can be found (I highlighted them in the scan from the decree on the right, if you can read Spanish). I find it interesting that besides being an extraordinary sloppy job of a decree it is also so direct and self assuming of its importance. If you ask me it is from the hand of a military turned bureaucrat, used to give orders and be obeyed. But in real life that does not work. Another example of the confusion reigning inside the regime comes from a "debate" between the head of the state oil monopoly PDVSA and Elias Jaua, a representative of the more radicalo-communist wing of the regime. It all started with del Pino saying that the nationalization of the services of the oil industry in Maracaibo Lake by Chavez in 2009 was a mistake. It is a taboo in Venezuela: oil industry should belong to the state. At least some good sense had prevailed in letting competitive services manage a large chunk of the oil industry, usually the more delicate work that required nimbleness, something that was not a given even in PDVSA best days. In short what del Pino was suggesting is that the private sector should not be banned outright from Venezuela's oil industry. Something very pragmatic since oil output has been dropping after 2009 and that with current oil prices and Venezuela bankruptcy we do not even have the money to keep the current level of production for much longer. That is anathema to the radical left that is unable to come to grips that the Chavez and Cuban models have failed, that the country is broke and that we have run out of food and medicine. In their minds there is a course traced by Chavez (Plan de la Patria) and it should be followed, period. Elias Jaua even goes one more stating that the said plan was discussed and voted upon and turned into law (it was an emanation of Chavez and thus was never properly discussed to begin with, and a monstrosity to read by the way). And thus we see the plain division between the "civilian" groups of chavismo, between those who think that something should be done and those that think nothing should be done, that we are all doing fine and that the only thing needed are yet more regulations, more controls, and now forced labor. It is interesting to note that even if one were to agree with the need for some strong initiative to restart production these come too late for Venezuela. When Chavez came to office in 1999 there was already a strong tendency for the state to rule over everything. On that aspect Chavez simply did one better, pushing the system to its last consequences, benefiting of disproportionate and undeserved oil rent to smooth things over and thus pretending that the private sector was not needed. Now there are voices inside chavismo that want to re discuss the model, and there are even admissions that only the private sector can take us out of the mess, After all, the forced labor decree is simply a way for the regime to force technicians from the private sector to work for derelict state companies. This is an admission, if any, that the public sector is incompetent, at least on that front to be charitable. As usual, excellent analysis Daniel and much a welcome entry. They are more and more infrequent. 1. "...a transition out of Maduro's mess". Don't you mean Chavez? After all Maduro is simply "el pagapeo"
2. "On that aspect Chavez simply did one better...". Don't you mean Maduro? There is a huge difference Daniel, one is still alive while the other one has been stinking for quite a while now. Probably stinking in spite of embalming. Someone correct me if I am wrong but is the forced labor model not directly taken from the Cuban play book too? At least my friend from Cuba claims so. Lots of chavista ideas are derived from the Castro dictatorship. The things they say, what they do, and the way a Cuban accent pops during their conversations tells me they are either mentored or given orders by Cubans. As a Cuban living in Venezuela and with access to the nomenklatura I also could sense their respect, and even fear. This lasted until they realized I was one of the other Cubans. I used to keep them confused saying typical Cuban slogans and bitching about Yankee imperialism. Up to a point you could say it was fun. Maduro could try to bring agricultural workers from Cuba, and give the Castro regime an opportunity to pay in this way for the oil they still get. After all, there is very little going on in the Cuban countryside at the moment and the farm worker won't be missed. Cuban volunteer farm workers have probably forgotten how to harvest sugar cane by now, but they will know about malanga and boniato. But most importantly, the absence of these dedicated workers will not affect Cuban private business. "After all Venezuela has been a dictatorship for a while, of a new XXI century kind certainly, but a dictatorship nevertheless." It's a disguised neo-dictatorship. A full-blown North-Korean type of Dictatorship would be rejected. But if you disguise it as a 'democracy', with some bogus elections, and some relatively censored media, and the mirage of a "parliament" (totally powerless Muddy assamblea..) then it's easier to get away with the Galactic Pilferage and Massive Thievery that has been going on. Then you just bribe the TSJ and the Military, and the Guardia Nazional y listo el pollo. When "el pueblo" goes to the streets and protests, a little repression, a few shots, a few go to jail. And when political opposition leaders talk too loud, you send them to jail (Leopoldo, Ledezma..) or you bribe them (half of the MUD is probably already Bribed) or you threaten them and extort them. So Caprilito calls for public manisfestations.. laughable. What was the result? These new type of disguised Dictators are tough to get rid of. Internationally they are viewed as somewhat 'democratic'. And internally, 'el pueblo' is also clueless. They don't understand what true Separation of Powers is, they finally accepted being sheep in long lines begging for food, year after year. Then they become Corrupt themselves, and complicit with the criminal regime. By the Millions. That's how the disguised neo-dictatorship perpetuates itself in power. They're finally starting to get it. It's the Castrista model: Create intolerable conditions so that most opposition, educated professionals leave the country. Then starve the remaining average people, until they start begging for food. Then utilize the bribed military and police to repress and build a Reign of Terror, of sorts, for decades. Meanwhile, claiming to be 'communists' or 'socialists' for 'el pueblo', get filthy rich, illegally, as fast as possible. And they do it slowly but surely, so people get used to the miserable mess. The Boiling Frog Effect. Today, thousands will be standing in line, praying for some harina pan, talking about baseball or the novela in line. That's what I'm told. Few people in line protest much anymore. They have become slaves, sheep, numb to the disasters. They are scared to protest (get on the dreaded list, lose their jobs, or their enchufes) They are tired, humiliated, vanquished. It's all about Tigres, segundas, palancas, inventos, rebusques, enchufes, what else can they do with 20 x a 'minimum salary? It's $12. You can't feed a family for one day with cheap arepas. So they are forced into shady businesses, corruption. Which is the goal of the Castrista/Chavista system: everyone left in the country must be somewhat corrupt, complicit, or beg for food. My friend let it go! Boiling frog, Cubazuela, Kleptozuela, everyone's a thief. Let it go my friend! Let it go! Your life will be happier and maybe we can go fishing. I saw a 90 lb. Tarpon almost landed at Cedar Key two days ago. Life is worth living, hell, ask Daniel! Dude, I live in Miami beach. I go fishing all the time. Spearfishing, preferably. That's when I'm not by the pool or hanging out in the sandy beach, surrounded by ladies in those bikinis from all over the world. Does that change reality in Kleptozuela? Could they use the excuse...there arent enough qualifyed Agr peeps ...in turn importing workers ..effecivly invading them by decree ...i dunno..:)...spitting in tbe wind....so much orther crazy things..
Look at it..its over.....military control...puppet president...starving pueblo. "theres food,u just need dollars"...now a conscripted labor force...Whaaaaaat!?!? As long as the opposition and Assembly continue to push the recall election (a joke as I said Maduro could just resign and the vice pres would be in for rest of term prior to such a vote) and the intelligent and brave continue to leave, die or be jailed I see zero hope for the people of Venezuela. For any foreseeable future they are Cuba but worse as they will go through much worse times to drive out all they can prior to providing any stability to the remainder. I am sure all they hope remain is enough to work the oil fields, diamond mines and country clubs; the rest I am sure the regime is hoping will leave the country. Have you heard if under Padrino the military will import food to Venezuela in a huge drug money laudering operation? It is clear to me that those who cling to a failed etiology in the midst of bankruptcy and starvation would become a persistent insurgency had the oppo been able to take control of government. It may well be a blessing in disguise that the crazed remnants of the regime remain in power long enough to completely annihilate whatever vestiges of credibility they might have. It is more likely for a recovery to succeed with these people completely removed from the scene! 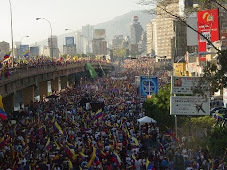 I have a question - is Venezuelan population seeking for emigration?